This option is ideal for someone who does not perform their own tire changes or rotations, wants to retain the looks and benefits of the factory wheel, and does not plan to keep the vehicle long enough for a second set of wheels to pay off. The vehicle is simply taken into a tire shop twice a year where the previous seasons’ tires are removed from the wheels and the other set is installed. The tires may be stored by the user and transported each time, or the tire shop may offer seasonal tire storage for a fee. The primary benefit of this option is in maintaining the factory look and wheel quality while saving the up-front cost of a second set of wheels. Original equipment factory wheels are typically prohibitively expensive, since their sales are targeted entirely toward insurance companies. So it is often not feasible to acquire a second set new. However, keep in mind that they can often be found for sale at reasonable prices as either used wheels or practically-new take-offs from owners who immediately replaced their stock wheels. The typical cost is $400 to $800 for a set on a newer vehicle, and $100 to $400 a set for older vehicles. The downsides to this option include the recurring costs and hassles of taking your vehicle in to a tire shop. Also, frequent tire swaps increase the chances that a wheel might be scuffed or damaged in the process of the changeover. That does happen occasionally, so it’s best to inspect your wheels for damage immediately before and after having any work done. Speaking of damage, road salt and gravel can also be hard on the finish of a wheel. Don’t expect the finish of your wheels to look pristine after a few years of exposure to that. Even if you start out with this strategy, keep an eye on Kijiji or other sources of used goods you may eventually find a good deal on a second set of wheels. Initial Costs: Winter Tires, installed – $800 ($500 to $2000). Annual Costs: Tire Installation – $100 x 2 = $200 ($120 to $240). This option is ideal for someone with limited funds, or who would simply prefer to reduce costs and/or avoid the hassle of bi-annual visits to a tire shop. It is especially suitable where the existing set of tires is approaching the end of life and would not be worth paying to re-install. This person does not do any high-speed summer highway driving and rarely corners or accelerates aggressively from a stop on dry pavement, as those driving conditions will cause rapid wear of a new winter tire. They are willing to sacrifice ultimate winter grip in the form of studded tires – or even the softer, more heavily-siped premium studless tires – for a non-studded studdable winter tire or an “all weather” winter snowflake-rated all-season tire. Both of the latter types will tend to have harder compounds and less aggressive siping for improved performance and treadlife in dry conditions. Any winter snowflake-rated tire will perform well in snow. It’s on ice and dry/wet pavement that the differences become more obvious. For those who do enjoy aggressive or high speed driving in summer and can only feasibly have one set of tires, an all-season tire may be an acceptable option, if it’s the right all-season tire. The all-season specification only measures tread void area and so it is essentially a rating of sufficient hydroplane resistance more than anything. Because it is not required to complete any winter performance testing, the winter capabilities between different all-season tires can vary dramatically. After this series, we’ll publish a future article on choosing an appropriate all-season tire for year-round or occasional winter use. A single set of tires is the least expensive option and does not require storage of a second set of tires. It is also the lowest effort option, requiring a visit to a tire shop once a year at most for an inexpensive rotation. With this strategy, you may still end up owning two sets of tires. Once this first set of winter tires is about half-worn and winter performance begins to degrade as they begin to resemble all-season tires, it may be desirable to buy a new set of winter tires and reassign the older tires to summer duty. The new winter tire set could then be a studded or premium studless tire since they wouldn’t see any summer use until the older set is taken out of service. As with Option 1, you may want to keep an eye on Kijiji for a good deal on a second set of tires or wheels. *Note that annual tire rotation can be avoided if desired. See our future guide on tire rotation for more details. This is the preferred option for those who plan to keep their vehicle long-term, especially those who want to perform their own seasonal tire changes. Winter tires can be installed quickly and conveniently at home without being at the mercy of a tire shop’s schedule during their busiest times, when everyone else also needs their tires changed. There is a large selection of wheel options and the prices can vary dramatically. Wheel selection will be discussed further in Part 4. 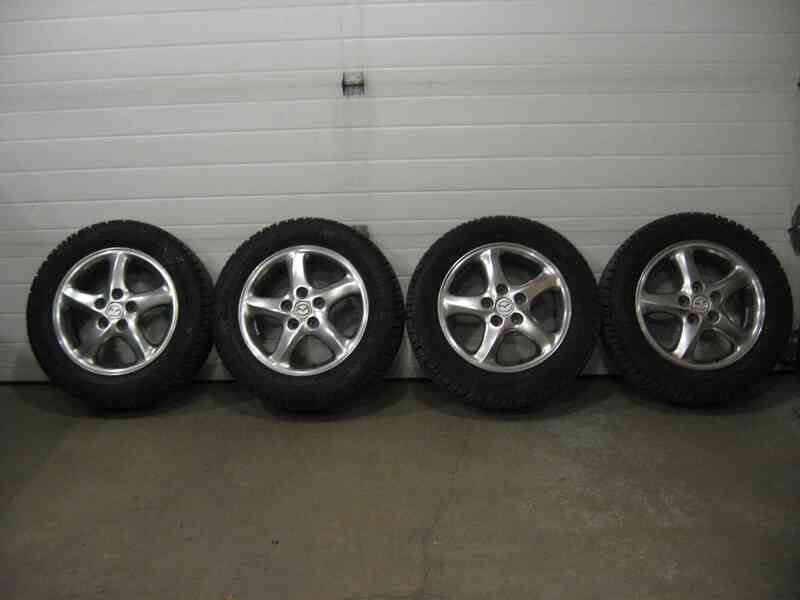 Initial Costs: Winter Tires, installed – $800 ($500 to $2000); Wheels – $800 ($100 to $1200). Annual Costs: Tire Shop Install – $60 x 2 = $120 or Self Install – $0. Got a plan? If so, stay tuned for Part 2 of our series to determine tire selection. If not, check back anyway for further information that may help with your decision, and keep checking Kijiji. You may come across a deal that makes the decision for you. The best ones don’t last long! Be careful though, as many sellers will try to deceive you. Hello. Where can we find and buy tire stud pins online? I decided to get a Brunno Wessel TSIT 9 so I could stud my own tires, but now need to buy studs. Also, a lot of tires here use just the TSMI stud #11-17 range, but many european studs are much better designs. Is anyone aware where we can get those stud pins? And which makes and models of those stud pins will work for typical TSMI stud holes? (eg use a typical CanTire Goodyear Nordic for an example – not the best winter tire, but very common) . Also, anyone aware of a tool that can properly drill stud pin receptor ‘holes’ in tire not OEM ready to accept studding? I don’t believe any of the proprietary stud designs that the European manufacturers use can be purchased. We have purchased TSMI studs and drill bits from a local Prema Canada distributor. To make the holes, you use a special drill bit with a collar to set the depth. Hopefully we’ll write a guide to doing this stuff someday.